When you access your project’s merge requests, GitLab will present them in a list, and you can use the tabs available to quickly filter by open and closed. You can also search and filter the results. When creating a merge request, select the “Delete source branch when merge request accepted” option and the source branch will be deleted when the merge request is merged. This option is also visible in an existing merge request next to the merge request button and can be selected/deselected before merging. It’s only visible to users with Maintainer permissions in the source project. If the user viewing the merge request does not have the correct permissions to delete the source branch and the source branch is set for deletion, the merge request widget will show the “Deletes source branch” text. Navigate to a project’s settings, select the Merge commit with semi-linear history option under Merge Requests: Merge method and save your changes. When reviewing a merge request that looks ready to merge but still has one or more CI jobs running, you can set it to be merged automatically when CI pipeline succeeds. This way, you don’t have to wait for the pipeline to finish and remember to merge the request manually. GitLab provides a way of leaving comments in any part of the file being changed in a Merge Request. To do so, click the … button in the gutter of the Merge Request diff UI to expand the diff lines and leave a comment, just as you would for a changed line. Start a review in order to create multiple comments on a diff and publish them once you’re ready. Starting a review allows you to get all your thoughts in order and ensure you haven’t missed anything before submitting all your comments. 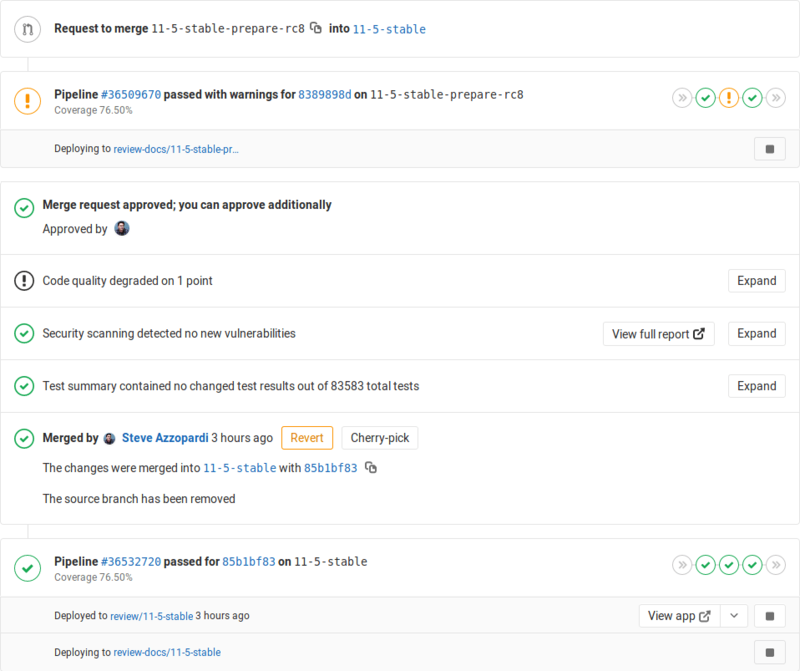 GitLab allows you to squash all changes present in a merge request into a single commit when merging, to allow for a neater commit history. Learn more about squash and merge. This feature needs incoming email to be configured by a GitLab administrator to be available for CE/EE users, and it’s available on GitLab.com. You can create a new merge request by sending an email to a user-specific email address. The address can be obtained on the merge requests page by clicking on a Email a new merge request to this project button. The subject will be used as the source branch name for the new merge request and the target branch will be the default branch for the project. The message body (if not empty) will be used as the merge request description. You need “Reply by email” enabled to use this feature. If it’s not enabled to your instance, you may ask your GitLab administrator to do so. If the source branch from the subject does not exist, it will be created from the repository’s HEAD or the specified target branch to apply the patches. The target branch can be specified using the /target_branch quick action. If the source branch already exists, the patches will be applied on top of it. Note: Git push options are only available with Git 2.10 or newer. Create a new merge request for the pushed branch. Set the target of the merge request to a particular branch. Set the merge request to merge when its pipeline succeeds. When viewing the commit details page, GitLab will link to the merge request (or merge requests, if it’s in more than one) containing that commit. GitLab implements Git’s powerful feature to revert any commit with introducing a Revert button in merge requests and commit details. To prevent merge requests from accidentally being accepted before they’re completely ready, GitLab blocks the “Accept” button for merge requests that have been marked as a Work In Progress. Learn more about setting a merge request as “Work In Progress”. If you want to make sure every merge request is approved by one or more people, you can enforce this workflow by using merge request approvals. Merge request approvals allow you to set the number of necessary approvals and predefine a list of approvers that will need to approve every merge request in a project. Read more about merge request approvals. Introduced in GitLab Starter 9.3. If you are using GitLab CI, you can analyze your source code quality using the Code Climate analyzer Docker image. Going a step further, GitLab can show the Code Climate report right in the merge request widget area. Read more about Code Quality reports. If your application offers a web interface and you are using GitLab CI/CD, you can quickly determine the performance impact of pending code changes. GitLab uses Sitespeed.io, a free and open source tool for measuring the performance of web sites, to analyze the performance of specific pages. GitLab runs the Sitespeed.io container and displays the difference in overall performance scores between the source and target branches. Read more about Browser Performance Testing. GitLab can scan and report any vulnerabilities found in your project. Read more about security reports. With GitLab’s Route Maps set, the merge request widget takes you directly to the pages changed, making it easier and faster to preview proposed modifications. If there’s an environment and the application is successfully deployed to it, the deployed environment and the link to the Review App will be shown as well. Deployments that are ongoing will be shown, as well as the deploying/deployed state for environments. If it’s the first time the branch is deployed, the link will return a 404 error until done. During the deployment, the stop button will be disabled. If the pipeline fails to deploy, the deployment info will be hidden. Sometimes things don’t go as expected in a merge request, here are some troubleshooting steps. Sidekiq didn’t process the CI state change fast enough. Please wait a few seconds and the status will update automatically. A merge request contains all the history from a repository, plus the additional commits added to the branch associated with the merge request. Here’s a few tricks to checkout a merge request locally.